At the change of seasons, I like to go through our outdoor closet and entryway. 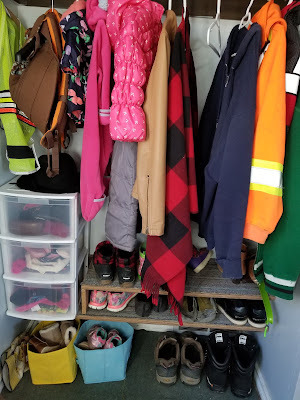 Weather varies so much from season to season so we can't possibly keep all of our outdoor gear in the closet for the whole year. I basically cleared out any summer items and made sure our fall/winter items are ready to go. 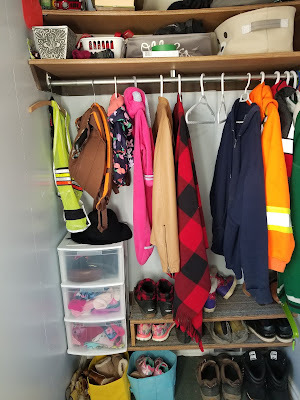 I sort through the summer items, clean things for next year and store them away in our downstairs closet. This summer, I had also brought a storage unit with drawers up from the basement to help contain our summer gear (bug nets, bubbles, swimming bag, sidewalk chalk, etc.). Now that summer is over, I got rid of the unit. Things are much better now. 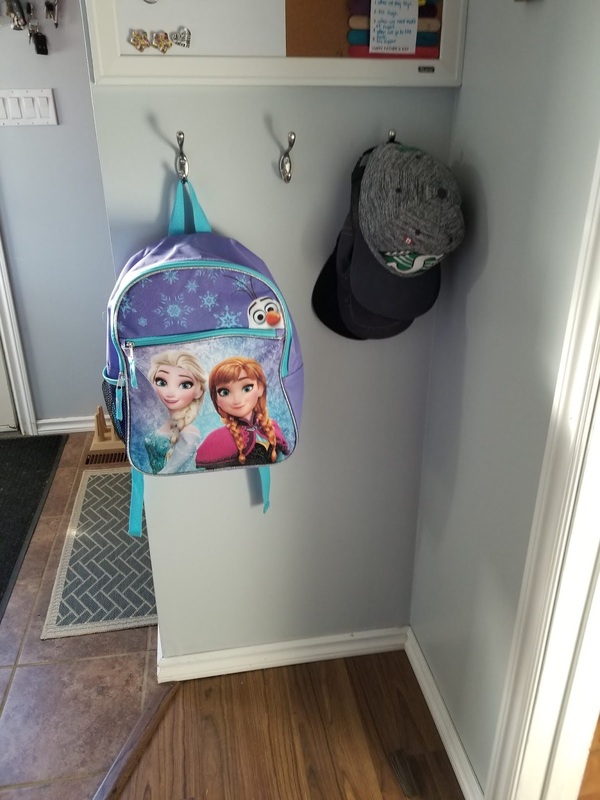 It is easier to get out the door because we only have what we need in the entry way. I am no longer digging through summer hats to find a touque. Keep only what you need by the door. It will help you streamline your morning. Go through your closet seasonally. Remove what isn't needed and clean up off-season items for storage. 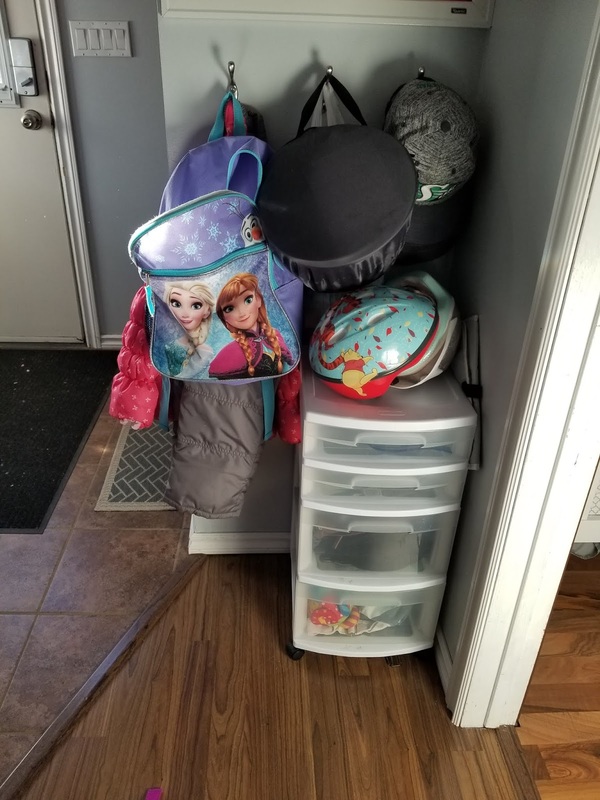 Have a system so that your kids (even young children) can put away their own things. My oldest daughter puts her shoes in her basket or on the shelf, puts her toque and mitts in her drawer, and can hang her coat on her hook. I like to keep baskets for our daughter's shoes. My oldest daughter keeps her dressier shoes and any regular shoes that stay dry in her basket. (Wet or dirty footwear must go on the shelf.) We also keep Baby Em's shoes in a basket. This frees up precious space on our shelves.